It’s was a Monday. It was 7:30 a.m. I was still in bed. The phone rang. It was Mom crying, telling me that the doctor had just called her at home with the unbelievable news that Dad had died. He was 68½ years old. Dad had a heart attack a few days earlier, but it was a mild one and he was recovering in our local hospital. Four days later, on that awful Monday morning, he had another attack – a fatal one. It’s twenty years since Dad passed away on 6 May 1996. For this 20th anniversary of that fateful day, I want to record some of my memories so that the passage of time doesn’t blur any further my remembrances of my beloved father. My first memory of Dad is seeing him and Mom get ready to go out. I asked Mom where they were going. She told me “to a meeting”. I had no idea what a ‘meeting’ was, but I was satisfied with her answer. I was about 5 or 6 years old and I can still see my parents in our basement apartment on Commercial Avenue as they left that evening. The best memories I have of Dad are when we spent time together, just the two of us. When I finished the winter term at university in Ottawa in April 1979, Dad came to get me and all my stuff to bring me back home to Timmins. He recently bought a new diesel pickup truck, probably a Dodge Ram. It was a pretty efficient vehicle and had dual gas tanks. I think we made the return trip home, which was a drive of about 8 hours (718 km or 446 miles), without fueling up. An easy thing for the truck, because when it was low on fuel, Dad just flipped a switch and the other tank took over. We stopped somewhere along the way for a coffee break, and I remember Dad fielded questions from interested car/truck owners telling them how great his truck was. My most vivid memory of Dad is of how much he’d laugh when he told jokes. 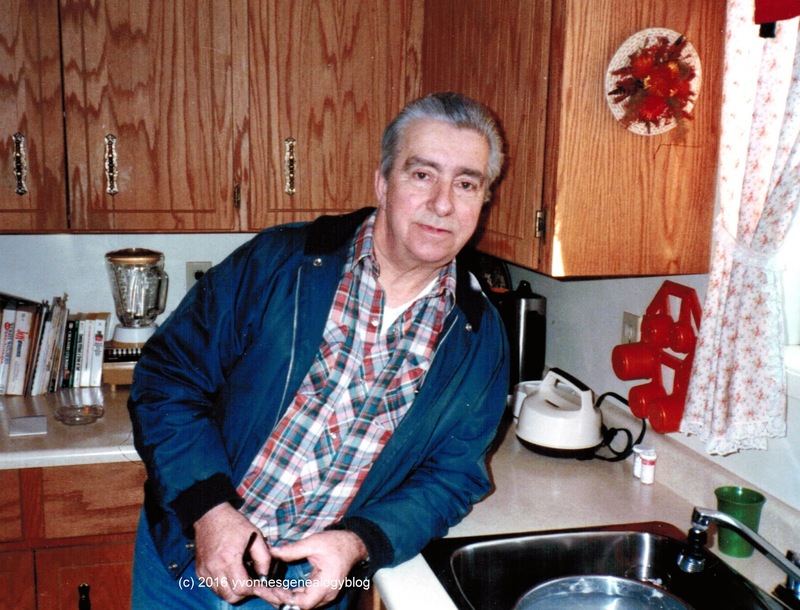 He loved telling the same old jokes over and over, especially at the supper table. It seemed just about anything would jog his memory and he’d start laughing even before telling the joke. He’d laugh before, he’d laugh during, and he’d laugh for what seemed like minutes after he was finished. Dad laughed so naturally and so good-heartedly. In that respect, Dad was a happy person who’d rather have a smile on his face and a sparkle in his eye and be ready to see the funny side of life. The most precious memory I have of Dad has to be how much he loved his family. He wasn’t one to usually hug us or praise us, because he was shy about showing his emotions. We knew just the same, though, that he profoundly loved us. He loved us when he’d give us practical advice; when he’d teach us to ride our bicycles and drive a car; when he’d make sure we were dressed warmly before going outside in the winter; when he’d come to hear us perform at school concerts; and when he’d encourage us to do our best at whatever job we undertook. I still miss Dad, still love him, and still think of him every day. I probably always will.